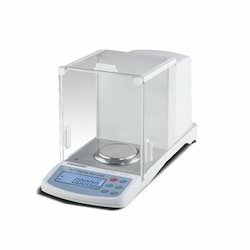 We are able to offer our renowned clients an optimum range of Analytical Balance. Our offered balance is precisely manufactured under the stern surveillance of our skilful engineers using supreme class components with the assistance of sophisticated technology. The provided balance is broadly admired amongst our patrons for its easy usage and sturdy construction. In addition to this, the offered balance is used in various industries and available at a pocket friendly price. 1. the vial crimper, mouth and handle part all is made of the stainless steel material, it is easy to clean and rustiness. 2. every tool made by us is customized, made one by one, not by production line. 3. We has the ability to design and manufacture vial crimpers to meet special or unique requirements, so the cap sealing on bottle will be perfect, 100% matched. 1. the vial crimper is ideal for low volume crimping operations and sample preparation operations. 2. the capping is safe, credible, tight, slick, good sealing. 3. crimping machine reduced housing pumps offers a lower cost alternative to screw-on pumps, yet provides an upscale look to your finished package. 3. crimping machine is safe and practical, there is no requirement for electricity or compressed air, trouble-free operation. 4. crimping machine head is machined to precise limits, more accuracy. this machine is widely used in perfume industry, where small and medium scale production is required. If there is more production required, and if it is more human labour available, then also this machine is suitable. 1. put the spray on bottle, put the crimping head above perfume pump and hold the crimping hand tight. 2. the tool covers the spray and a pulling action of the tool is occurring during pressing the handle. This causes the perfect cap sealing to the bottle. 1. there are 2 parts crimping head and crimping hand. 2. the hand crimper is designed and built with an adjustable pressure block in the crimper head that allows the operator to adjust the overall length of stroke that the cone moves when the seal is crimped. 3. our customer service and technical department is available to answer your questions about our product or need help to decide which one is the right one for you. 1. the Athena vial crimper, mouth and handle part all is made of the stainless steel material, it is easy to clean and rustiness. 1. the Athena vial crimper is ideal for low volume crimping operations and sample preparation operations. Looking for Lab Balances ?